Mobile app design plays an important part to entice the users and customers. UI/UX trends keep on changing according to the demands and market needs. Nowadays, it is important to stay updated with the technology to stand out in the competition. 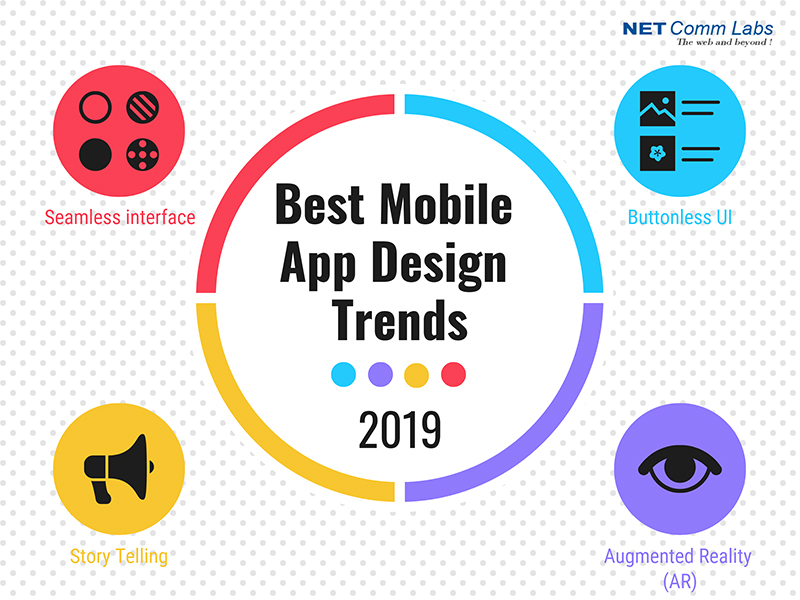 2019 has brought a new technology for all the mobile apps to be integrated into the old ones. With the development and increasing number of apps in the market, it is difficult to make out which one is the best. Each and every app is on the run to be the only choice for its users and for this purpose, mobile app designing company in Noida is leveraging the latest trends and technology while designing and developing a mobile app. The first thing that comes into mind while creating an app is the mobile UI design. Mobile app design service is the eye-catching one, it is the service that makes user or customer stay and explore the page. Thus, a seamless interface is of utmost importance as it keeps the user occupied and engaged. It will most likely help in the downloading of the app because of its unique interface. A good mobile app creates the best and long-lasting relationship with its customers. The mobile app design these days are built with the concept of story-telling related to a company’s service or products. These self-explanatory illustrations, videos, graphics, etc., tell a brand’s story that is engaging and helpful in building a customer base. The age-old practice of uploading content is now fading away as the graphics and the videos interact more deeply and modify the screen into a propelling one, forcing the users to click and engage with the app. AR technology is present everywhere. Many mobile app designing companies in Noida are opting for AR to produce the best user interface for the users and customers, that are functional and useful. AR is a technology which can be used in any app, be it gaming app, home decor, health care or teaching app. This technology enhances the user experience by integrating technology into reality. Augmented reality has become a vogue for mobile app users. Mobile app designing companies in Noida and Delhi NCR are making use of this technology which gives them a unique opportunity to connect with their audience over other apps. Businesses don’t just require easy navigation and enhancement for the benefit of users, but it also wants to cater to user satisfaction and convenience. For this purpose, the shift towards buttonless UI is growing and becoming popular day by day. This UI feature in mobile app design forces the user to perform some action, to know more and tap on the screen. With Instagram, to Gmail to many other apps are making use of this. Just tap or swipe is enough to perform an action. The UI/UX of the page is neat and clean, delivering a whole new experience to the users.